DJ EQ mixing tips: Transform your sets and impress the crowd! Lets check out the top 5 DJ headphones and provide you with the ultimate buyers guide that contains everything you need to know to get the best DJ headphones possible! Many DJ's don't realise just how important a good set of headphones are. When I started mixing, back before the internet offered awesome 'best DJ headphones' articles (wink wink), I went through dozens. I bought many budget headphones and even some expensive pairs that were useless. Some of them sounded great, but wore out in no time! When I throw a pair of headphones out to make way for a new pair they are usually working perfectly. The most common things to wear out are the materials around the headband and the ear pads. Plastic hinges can also break and weak headbands can snap. A DJ's headphones need to be durable. When you DJ, your headphones take some serious abuse. When you're DJing in loud clubs they'll be punished with constant high volumes and sweat. They'll be on/off your head over a hundred times per set, pulled on, twisted, and thrown unprotected into your bag after the set. So what do you need to take into consideration when buying a pair of headphones? The best DJ headphones will have certain qualities that are important. Your chosen headphones should tick as many boxes as possible. As previously mentioned the materials on cheaper headphones usually wear out first. So look for quality material and strong stitching around the headband. The ear pads also need good quality materials as they can eventually wear, crack, and split. You'll want a pair of headphones with strong, well made joints and hinges to handle to constant movement. Plastic parts on highly stressed joints will eventually crack so look for metal hinges etc. Cables can eventually break so removable cables can be a great option. The headphones may be working perfectly but if a sealed in cable breaks at the joint there'll be no repairing them. Also look for headphones with a single cable, this will keep the cable out of the way and stop tangles. A folding design will also be important for comfort during mixing and for transport. I've also found headphones that don't fold or swivel usually break fairly quickly, either during mixing or in transit. Closed back or open back? Open back headphones are great for audiophiles and home use. They let air pass through the ear cups to prevent pressure build up and distortion. This also lets in a lot of background noise, so you'll hear everything that's happening around you. This makes it a bad choice for DJ's. If you are DJing you'll want a headphone that seals off as much external noise as possible. If your playing at clubs or mobile DJ gigs you'll also want to block out crowd noise. This is important for perfect beatmatching and precise mixing, and is the reason why a closed back design will make the best DJ headphones. You'll want powerful drivers that are capable of holding high volumes for extended periods. They'll also need a good frequency response/range. This will be important for delivering as many frequencies from your music as possible. This will all aid in better and faster beatmatching and higher quality mixes with crisper sounding audio. Some of you may know that the human ear can only hear frequencies ranging from 20-20,000Hz. If a DJ headphone can match this, great! But some manufacturers are now trying to offer even wider ranges. The wider frequencies can be felt to a certain extent so this may have some importance for DJ's. We spoke about closed back headphones being important to stop noise entering the headphones ear cups from the back. But the best DJ headphones will always feature good noise isolation to stop it entering around the edges. This is once again important in loud clubs with screaming ravers, and will certainly help with mixing and beatmatching. But another benefit is that less volume is needed to the headphones to hear its output over the crowd. This will therefore put less stress on the drivers. So now you know how to find the best DJ headphones we can get to the fun part. This list has been built on personal experience watching what DJ's use and the feedback they give to me. I've also used some of these headphones and own one of them. I've also read costumer reviews and took all feedback into consideration to compile the best DJ headphones list possible. The recommendations below are in no particular order. The Sennheiser HD 25 Plus is considered by many DJ's to be the industry standard headphone around the world. And stories of rough everyday use over a period of many years confirm the durability to be exceptional. They're not the prettiest headphones on the market but the HD 25 plus is made for performance not looks! The HD 25 plus has been designed to be super lightweight and comfortable when worn for long periods. It weighs a tiny 140 grams making it perfect for DJ's that need lighter headphones. It's also been built with longevity in mind, with every part of the headphone being replaceable. This means that if the headband or ear padding were to wear out like many headphones, you'd have the option to replace it! The sound quality is fantastic due to the lightweight aluminium voice coils. The HD 25 plus offers 16 - 22000 Hz frequency response meaning you'll hear the full range of frequencies your tracks have to offer. The mids and highs will sound crisp and clear while delivering tight low frequencies. They aren't the most bass heavy headphones you'll find but they're still plenty enough for DJ's. They come with a 2 year warranty which backs up the reliability and durability. 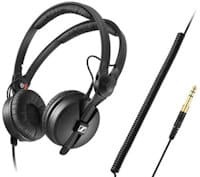 And Sennheiser have even thrown in some extra goodies to give you more options. You'll get an extra pair of velour ear pads, and an additional 1.5m-3m straight cable. And you'll also get a carry pouch to keep them safe in transit. Overall this is a fantastic headphone that hasn't been changed in 25 years of manufacturing! This is a time proven product that comes highly recommended by professional DJ's and sound engineers. Next up in the best DJ headphones list is another favourite with the pro's.. The V-Moda Crossfade LP2 is a top rated purpose built headphone with a lot to offer. Before we get to some of the features, I have to give a hats off to V-MODA for offering their 6 star service guarantee. This means that when you receive the crossfade LP2 you'll also receive a whole 2 year warranty. You'll also get a 60 day test drive guarantee, which shows their confidence in this product. Plus, if you somehow manage to break the headphone you'll get a lifetime voucher for 50% off a replacement. These are all services that really show you a good confident manufacturer. V-MODA have put this headphone through some very rigorous durability testing. With over one million cable bends, over seventy 6ft drops, and ten headband bends all the way to flat. They've also given it high and low temperature, humidity, salt spray and UV exposure. And it still worked afterwards! It has a steel frame and comes with gunmetal aircraft grade metal shields that screw onto the earcups. These shields can also be customized to your preferred color with V-MODA's custom anodised shield kits. The Crossfade LP2 has a detachable audio cable that's Kevlar reinforced and comes with a 1/4" adaptor. It also comes with a reinforced SpeakEasy 1-Button microphone cable with voice recognition. This will plug into smartphones and tablets, including apple and android, which I thought was really cool. It has large 50mm drivers and a 5 - 30,000 Hz frequency response so it's perfect for all DJ's. The low, mid, and high range are all very crisp and clear. And if you like your headphones with plenty of bass the Crossfade LP2 will have you smiling ear to ear. They also come with a exoskeleton foam fitting, hard shell case with extra storage for cables, USB drive etc. It also has a carabiner clip to keep it secured to your DJ bag. 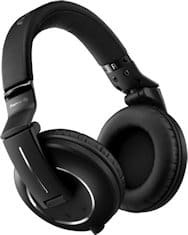 Overall this headphone is truly fantastic and recommended to all DJ's, sound engineers, and music lovers. I've used it for DJing and day to day music for over a year and the sound quality is incredible. Next up is a well tested and very highly rated headphone from Audio-Technica. 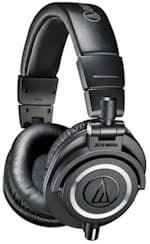 The Audio-Technica ATH-M50x is one of the most highly rated headphones on the market. It's highly recommended by DJ's, music producers, and music lovers, and has maintained a 4.5 star rating on amazon, on over 5000 reviews! The ATH-M50X is an updated version of the ATH-M50 which has been time proven since 2007. This model offers some updated features including detachable cables and stronger drivers. The headphone offers a tough foldable design with full 90 degree swivel joints (both directions). This makes it perfect for DJ's that use one-ear shoulder monitoring and enjoy the full range of movement. 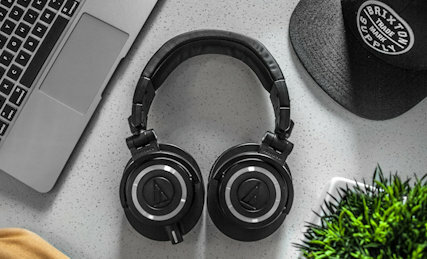 The ATH-M50x comes with 3 detachable and replaceable cables. This includes a three meter coiled cable that is perfect for DJing to avoid tangles and accidents in the booth. It offers a frequency range of 15 - 28,000 Hz thanks to its 45mm drivers. These feature copper-clad aluminium wire voice coils that make the headphone light while still producing a perfect signal frequency. It also offers great noise isolation, important for DJ's to help keep out those unwanted noises. The sound the ATH-M50x produces is just incredible. You'll get accurate but punchy bass frequencies and crisp high hats with no ear punishing distortion. The headband and ear pads are made from Professional-grade materials to withstand heavy DJ use. Unfortunately Audio-Technica don't offer replacements, but the headphones do come with a 2 year warranty for peace of mind. The headphones come with a cloth pouch to keep them safe and clean, and as previously mention three different cables. These include a 1.2 m - 3.0 m coiled cable perfect for DJ's, and a 3 m and 1.2 m straight cable. They also include a screw on plug adaptor which comes in handy for using mixers with a single headphone input. Overall the ATH-M50x offers fantastic sound reproduction perfect for a wide range of applications. DJ's will find these perfect for mixing, while the sound clarity will appeal to producers and audiophiles. A great set of headphones, it's just a shame the materials aren't replaceable. Next up in the best DJ headphones lineup is a super stylish and highly rated purpose built headphone. And it's the second time we've seen Sennheiser show up in the list! There's a reason Sennheiser have showed up in this list twice.. It's because they really do make darn good headphones! The Sennheiser HD8 DJ have been designed and purpose built alongside some of the worlds top DJ's. Sennheiser have taken into account everything the modern DJ needs and designed the ultimate DJ headphone. The HD8 have been built with everything we mentioned at the start of this article in mind. 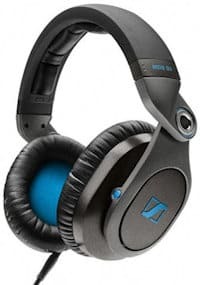 Sennheiser have focused on strength, durability, sound reproduction, noise isolation, and longevity. And in the unlikely event of something breaking, all parts are replaceable! The headphones are a primarily metal construction. This includes the the earcups, headband attachments and the extenders. The pivot rings are also made from metal for added strength. This is something that always breaks on cheaper plastic headphones, so metal rings are important. The main headband is made from a super flexible but rigid material. You can bend and twist it and it will not break or crack. The headphones are very comfortable (I don't own a set yet but I've tried them). I love the way the earcups are shaped to let your whole ear fit nice and snug inside. This wasn't an accident though, sennheiser designed them this way for maximum noise isolation. The velour ear padding is also great, it's replaceable, and there are a spare set included in the box! They feature a full swivel design for comfort while mixing, and they also completely fold down for safety in transit. The sound reproduction is fantastic, giving crisp and clear sound with A LOT of bass. This is due to the large 50mm drivers that give a very wide frequency response of 8 – 30,000 Hz. They are capable of enduring very long periods at high volumes with no distortion. You can really tell that they've been designed with beatmatching and mixing in mind. They come with 2 cables, 1 straight, and one coiled. These headphones have two connections, one on each earcup, and these cables can plug into either. Once they plug in they have a twist lock to prevent them coming loose whilst in the mix. They also come with a nice solid carry case with a zip to keep them safe during transport. And they're backed by a 2 year warranty for peace of mind. They're not cheap, but they could well be the best DJ headphones on this list! And given the competition that's a bold statement. So overall these are perfect for working DJ's or home DJ's that want the best. They are very durable and should last you for many years to come. Last but not least on the list of best DJ headphones is a true workhorse. 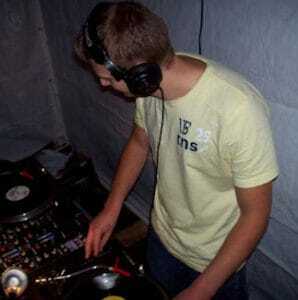 When I'm out gigging, the Pioneer DJ HDJ-2000mk2 is one of the headphones I see used the most by other DJ's. It's the industry standard around the world, and it's been purpose built with working DJ's in mind. First off, it's very comfortable! You'll notice the shape of the headband is not as rounded as most headphones. Pioneer don't list this as a selling point, but I definitely think it's been done with comfort in mind, as they feel great. The headband is also well padded which feels very nice against your head. And they don't get uncomfortable or cause any pain after wearing them for long periods like some headphones. The earcups are also very comfortable and use memory foam for a moulded fit around your ear. This also gives great noise isolation from external noises in loud clubs. They have a full swivel design that suits various methods of DJ monitoring. One ear on the shoulder monitoring is easy, and you can also fold them right down for transport. The HDJ-2000mk2 is very durable and has been built to withstand the stresses of professional DJing night after night. It uses metal for all of its most highly stressed joints and for most of the visible parts. This makes them very strong but surprisingly light, weighing in at just 298 grams. Hidden in the earcups are powerful 50mm drivers capable of producing 107 decibels! It has a very wide frequency response of 5 - 30000 Hz and the sound reproduction is perfect. The low end bass frequencies are very punchy but very clear and the highs are crisp with no distortion. In the box you'll get a solid carry case to protect your beloved headphones. You'll find one detachable coiled cable, one detachable straight cable, and a jack plug adaptor. Both cables come with a mini XLR plug that locks into the earcup. This will prevent the plug coming lose if you snag the cable in the DJ booth. The Pioneer DJ HDJ-2000mk2 comes highly recommended for DJ's that need a super strong design with superior comfort. That just about rounds up the list of the best DJ headphones on the market. These headphones are all great choices and whichever one you chose from the list will bring you many years of quality DJ monitoring. For a full explanation on using DJ headphones go here -> show me how. Thanks for checking out this article. Anybody new to DJing can find out the best setups available for beginner DJ's HERE. The article will teach you everything you need to know about the different setups available to you. If you've been in the game for a while take a look at these top advanced DJ tricks > HERE. 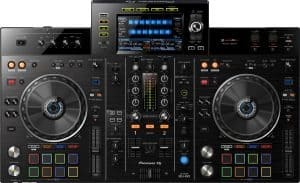 Pingback: Serato DJ VS Traktor Pro 2 – which DJ software is best?